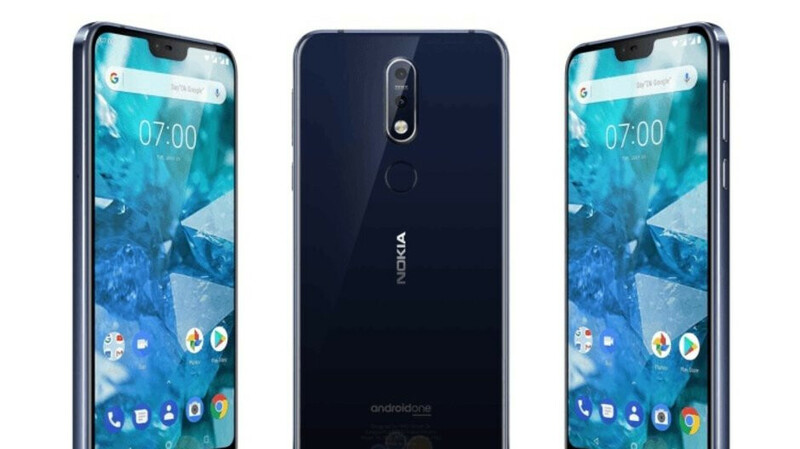 There’s been a great deal of confusion surrounding HMD Global’s mid-range smartphone release plans lately, as the Nokia 7.1 and 7.1 Plus monikers were almost used interchangeably to describe a large “notchy” handset widely expected to be unveiled in India next week. Luckily, Roland Quandt is here to help solve this puzzle after recently leaking the Huawei Watch GT, OnePlus 6T, Microsoft Surface Pro 6, and even the purportedly official marketing name of HMD’s long-awaited flagship. As it turns out, the Nokia 7.1 is quite different from the 7.1 Plus, basically aiming to marginally upgrade the specifications of the original Nokia 7 released about a year ago. As such, you’re not looking at Snapdragon 710 processing power here, but rather a significantly humbler Snapdragon 636 SoC, paired with as little as 3GB RAM and 32GB internal storage space. Don’t worry, a 4/64 gig configuration is also reportedly in the pipeline, while the rumored 6.2-inch display of the Nokia 7.1 Plus should be reduced to 5.84 inches on the 7.1. A not-to-wide screen cutout is tipped to result in a somewhat awkward 18.7:9 aspect ratio and respectable 2244 x 1080 resolution, while physically accommodating a single 8MP selfie shooter. Around the back, the Nokia 7.1 will most likely feature a dual Zeiss-optimized 12 + 5MP camera setup, but curiously enough, this Android One phone could run the slowly aging Oreo software flavor out the box instead of the 9.0 Pie version already powering the Nokia 7 Plus. All in all, the glass and aluminum-clad Nokia 7.1 doesn’t look half bad on paper (although that chin is seriously chunky), targeting a crowded and very competitive price bracket. If Quandt is correct (and he almost always is about this stuff), the 3/32GB variant could be priced at €350 on the old continent, with a full €400 charged for a configuration packing an extra gig of memory and twice the local digital hoarding room. It’s probably not going to be easy for the Nokia 7.1 to find mainstream European relevance at that price point. Pricing is horrible.Should have come with SD 660.Poco F1 is way better than this mediocre thing. Moto Z3 Play is a better option..or better just get the cheaper Nokia 6.1 Plus with the same SD636 processor. I wouldn’t say that, especially since Motorola hasn’t been good with updating their phones since being taken over by Lenovo. HMD, on the other hand, has been fantastic with OS and security updates. I bought the Nokia 6.1 Plus last week (my first Nokia phone in almost a decade!) and although I am running the latest Android 8.1 version, it is a bit laggy unlike my Moto X4 (non-Android One version). I experience bluetooth connection issues, jittery UI with this Nokia phone. They probably want to have a good reputation and just straight away push the updates without thoroughly testing (I'm a software tester FYI). And the build quality is NOT great. The plastic inserts are NOT co-molded with the metal frame. and even the metal frame feels cheap (like the ones used by China OEMs). Did I regret buying it? Absolutely not. I like the compact 5.8 inch body and I can use GCam without issues. Also based on the leak, the 7.1 has a relatively bigger chin than 6.1 Plus. Maybe you have a defective unit? I know thst I've heard nothing but good reports about the performance of the 6.1 Plus. I have the 6.1 and it performs pretty good. I've had zero connection issues, and haven't heard of any connection issues regarding this phone. The 6.1 Plus is also Android One, so the updates come straight from Google to the handset, unless the OEM has other stuff specific to their phones that they want to add. The Nokia 6/6.1 have the beat designs out of the current Nokia smartphones, IMO. But I haven't heard of any design issues regarding the build quality of the Nokia 6.1 Plus. Calm your pants guys, the product is not yet officially released. So Nokia 5x, 6x and this have basically same specs and same dimension's? As a successor to the Nokia 7 (not the 7 Plus), this isn’t bad at all. Looks good. I think people are confusing this as a successor to the 7 Plus, which is what the 7.1 Plus is.